Teriyaki Chicken Stir-Fry Recipe - Bake.Eat.Repeat. Happy New Year everyone! Okay, it’s the 7th, not really New Year’s anymore, but this teriyaki chicken stir-fry is my first post of the year so I’m going with it. I had a nice long break from my computer over Christmas, didn’t touch it much at all for two whole weeks, and I have to say it was rather lovely. As much as I enjoy this little hobby of mine, it does take up a fair bit of time, a good portion of which is sitting at a computer. It was quite nice to close it and just play with my kids for a couple of weeks! Skating, sledding, building an excessive number of Lego creations. All good. And now I’m rambling about it because I’m having a hard time getting back into computer-y things when I’m halfway through a good book and I kind of want to go sit down with another mug of coffee and a blanket and my book while looking out the window at the snow and pretending that it’s still vacation time. Anyone with me? Unfortunately, vacation can’t last forever. Luckily we’re starting the New Year with 30 Minute Thursday, and a list of meals that are on the table in 30 minutes or less, from myself and some of my blogging friends. This month I have an easy teriyaki chicken stir-fry for you that is easily made in under 30 minutes and is fantastic served over hot rice. Plus, it’s easily customizable to what you have on hand. Use a different protein, change out the veggies to whatever you have – this just happens to be the combination that we liked the best, but change it up to work with what you have on hand. Make sure to check out the other 30 minute meals from my friends, the links are below the recipe. You can also find past 30 Minute Thursday posts here. In a small bowl, whisk together the soy sauce, honey, orange juice, brown sugar, sesame oil, garlic, ginger and corn starch. Set aside. In a large non-stick skillet, heat the olive oil over medium heat. Season the chicken with salt and pepper and add it to the hot skillet. Cook for 1-2 minutes on each side until no pink remains. Add the zucchini, broccoli and red pepper and continue cooking, stirring occasionally for 4-5 minutes until the vegetables are crisp tender and the chicken is cooked through. Whisk the sauce together again and add it to the skillet, stirring to coat everything. Cook for another 1-2 minutes until the sauce is heated through and slightly thickened. It doesn’t thicken much, just very slightly. Serve over hot rice and garnish with green onions if desired. Source: Adapted from The Weight Watchers New Complete Cookbook . Happy New Year! It's so nice to take a break from the computer. :) Love a good stir fry recipe. This Teriyaki Chicken looks so good! Holiday breaks are definitely needed!! And easy meals are also essential for getting back in the swing of things! 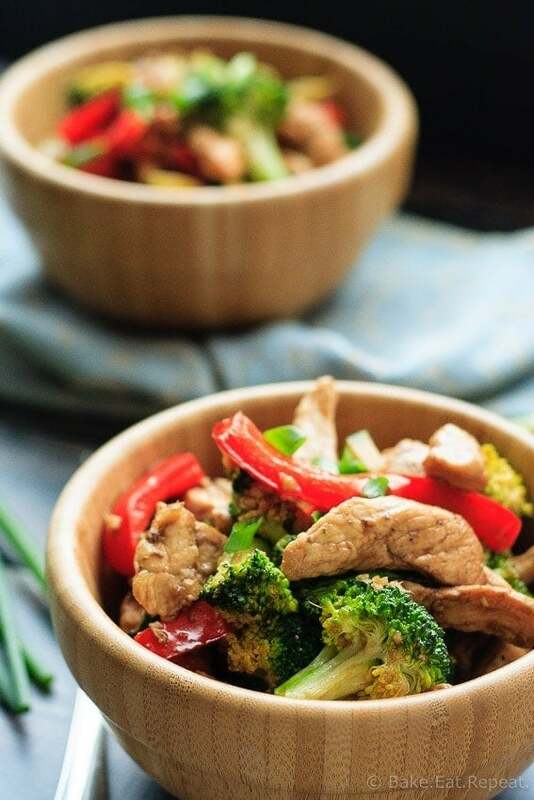 Stir fries are one of my fave easy meals-- this one looks delish!! I barely touched my computer over the holidays too, and it's so nice to be disconnected for a little while! But I'm glad your back to share this amazing recipe. I haven't had teriyaki chicken in ages, but now I'm totally craving it! It's so nice to disconnect sometimes isn't it? Glad you had a nice break too Rachel! Happy New Year Stacey! Glad you had a great time off, but I feel the same about getting back to blogging :) This stir fry looks delicious! Perfect for the cold weather here, will try it! 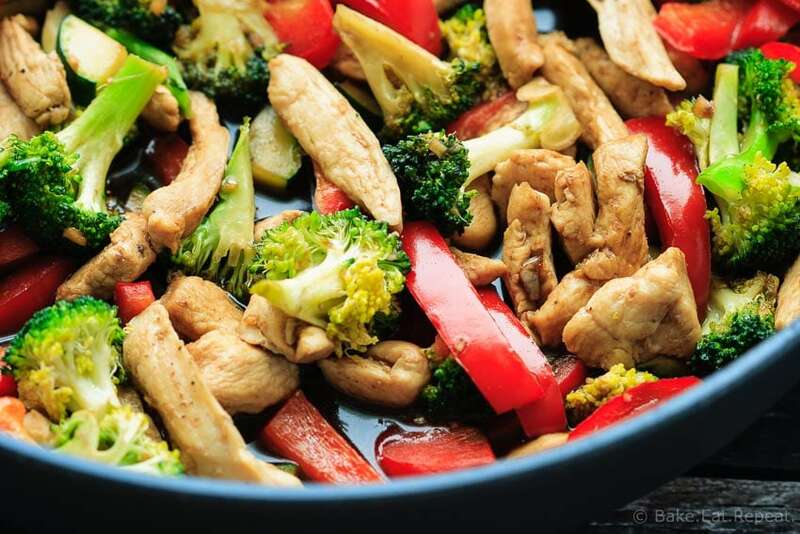 I just love stir-fry and this one looks fabulous Stacey! I had such a great break too - left the computer alone for the most part and soaked in all the relaxation (and good food). This stir-fry looks SO good, Stacey! I'd take a homemade meal like this over takeout any day. And I am with you on the wishing it was still vacation. It always goes by way too fast! I also had a computer break over the holidays! It was definitely nice :) I love me a good stir fry! Love that it's made in under 30 minutes! Happy New Year, so glad you had a nice break, Stacey! Thankfully we have all these 30 minute meals to help us get back on track. 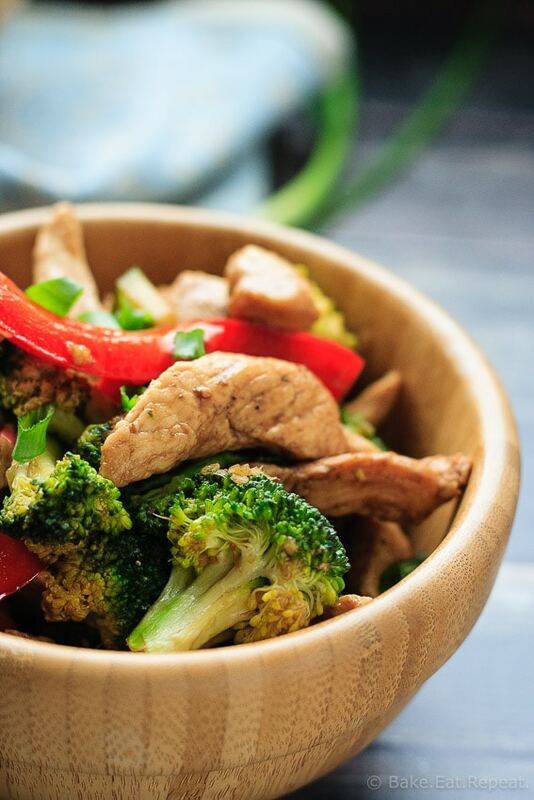 This stir fry looks so healthy and delicious! Love the pretty colors! I think it's pretty much acceptable to say Happy New Year for the whole month of January. At least, that's my rule! Glad you had a nice break from the computer! This stir-fry looks amazing. A win for colorful, healthy food! 2 weeks off sounds wonderful! I'm glad you are back though :) That teriyaki sauce sounds amazing! Exactly! It was a lovely break! Thanks Brielle! Love how quickly this delicious meal comes together! It was nice taking a break for the holidays but now back to the grind! Meals like this make it so much easier to get back into a routine because fast 'n easy is where it's at! And I love teriyaki -- this is calling my name! Oh this looks incredible! I love that this is quick, easy and healthy! I haven't had teriyaki chicken in SO long and you're totally giving me the biggest craving right now, Stacey! I love how perfect the veggies look and that sauce sounds like perfection! Oh this teriyaki chicken looks wonderful, Stacey! Definitely a great meal to have after the new year! And I love how easy it is to whip up. Stir fry recipes are my favorite, so I can't wait to try this out!